Reginald Murphy Centre, Potts Point Where Are We? 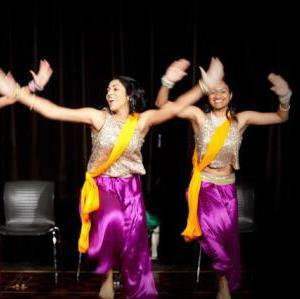 Bollywood is a colourful and vibrant dance that is energetic and yet graceful that leaves you wanting more! It’s great for men and women and perfect for fun fitness. It is a physically invigorating dance to upbeat, energetic and fun tunes. This workshop will be an exciting way to learn some basic Bollywood moves like the well known Bollywood ‘head move’, ‘screw the light bulb’ and yes…. the exaggerated big Bollywood hip moves! Furthermore it is a great way to immerse your self in this wonderful culture of colourful song and dance and have a great work out at the same time. We will begin with a short warm up and teach some of the basic and popular Bollywood moves. This will then lead to a fun choreographed routine being taught. Dharsha is the Artistic director of Monsuun Dance based in Sydney. She has been teaching and performing Bollywood dance for just over 7 years. Having always loved all types of dance, she was drawn to the colour, cheekiness and energy of Bollywood and enjoys choreographing, performing and teaching this wonderful type of dance. Monsuun Dance holds regular Bollywood dance workshops, private lessons and offers professional dance performances at any special occasion. Created for the love of dance, Monsuun focuses on spreading their passion for dance through their choreography, performances and classes.